The leading factor contributing to home heating fires (25%) was failure to clean, principally creosote from solid-fueled heating equipment, primarily chimneys. Excerpt from National Fire Protection Association . Minimize the risk of fires started in your chimney, schedule your Chinmey Inspection & Cleaning early! "Excellent work - courteous technicians." The Professional Chimney Sweep will arrive at your home in a white company van which will have our red and black logo on the side. Our first concern is to insure your home will remain clean during the cleaning process. Chimney cleaning or sweeping, easy as 1, 2, 3. We value your family's safety. Most often overlooked is your gas or oil flues, they should be safety inspected on an annual basis for any soot deposits or debris blockage which could lead to dangerous carbon monoxide poisoning. We clean and inspect your fireplace from the chimney top to the hearth. We look for safety hazards and look for possible moisture deteriorating your fireplace. Once we're confident that you're safe and up to code, we can also introduce you to a full range of fireplace products and services. 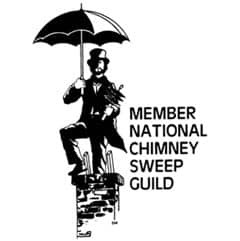 Chimney maintenance is best achieved through annual inspections, and mechanical sweeping, by trained professional chimney sweeps as frequently as needed. 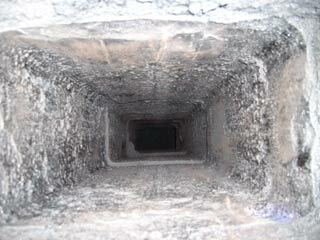 Chimney inspections often reveal hidden problems with a chimney structure that could be potentially hazardous. Mechanical sweeping of chimneys not only removes layers of creosote from the chimney surface, it removes the resulting loose soot and creosote from the chimney, fireplace, or wood stove. A substantial percentage of fireplace and wood stove chimneys do not provide a straight path from the firebox to the outside. If chemical chimney cleaning products perform as claimed and cause debris in the chimney to fall, that debris still needs to be removed from the smoke shelf, baffle, catalytic combustor, or offset in order to ensure a properly functioning chimney. Can't chemical products produce the same results as a Chimney Sweep? Chemical products that claim to clean or assist in cleaning chimneys are not new. Indeed some of these chemical products are used successfully by professional chimney sweeps in conjunction with the mechanical cleaning of a chimney. 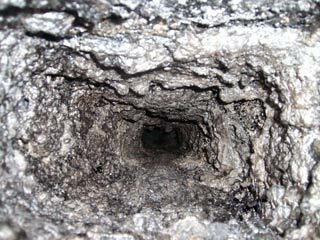 In some situations a chimney can develop a hard or tacky layer of creosote in the chimney that cannot be removed by normal mechanical brushing. Under the supervision of a qualified chimney professional certain chemical cleaners may be used to change the chemical composition of the hard or tacky layer of creosote into a brittle or powdery condition to facilitate its removal.